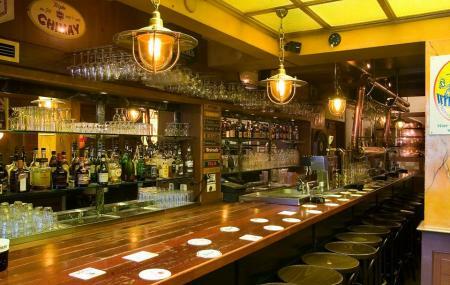 An interesting place for all the beer lovers, De Bekeerde is known for its intriguing history and not less than enticing drinks. While most of the breweries in the city boast of modern and chic characteristic, this one set itself apart by clinging to the traditional vibe of the old era. De Bekeerde Suster was initially an abbey which became a solace for repenting prostitutes. In fact, its literal translation somewhat means just that- ‘The Reformed Sister’. Named after Mary Magdalene, the reforming nun of the place, it later became a well-known refuge for people around the city. Thereafter, they started their own brewery which flourished into one of the most sought after hang out destinations in the city. Ensure to visit for its range of drinks, well tested and prepared, that will not only suffice your appetite but will have your taste buds in frenzy. Bringing in the new delights of this era and mixing it with its old and traditional approach definitely makes this a place to be! Prices differ for varied drinks. How popular is De Bekeerde Suster? People normally also visit Van Stapele Koekmakerij while planning their trip to De Bekeerde Suster. Great traditional beers to go with amazing food. Everything tasted fresh and was reasonably priced. I will definitely try visiting when I am in Amsterdam. Their homemade beer bread and bread butter is something you definitely should try when coming to De Bekeerde Sister to try their craft beers. They have 4 beers they make themselves, with one of them changing every season and offer a tasting menu to try all four; besides a large selection of beers arranged by type. Very delicious food and most importantly, great locally brewed beer! Me and my friends tried the seaosnal beer from the brewy and they are very rich in flavor. Not super expensive but still good! Lovely environment and friendly staff too. Recommend it! Great selection of beer! In terms of food, I recommend their bacon & cheese burger. A bit expensive, but you won't find anything significantly cheaper in the city center. When I visited, they had only 4 own beers on tap, but the burger was good.